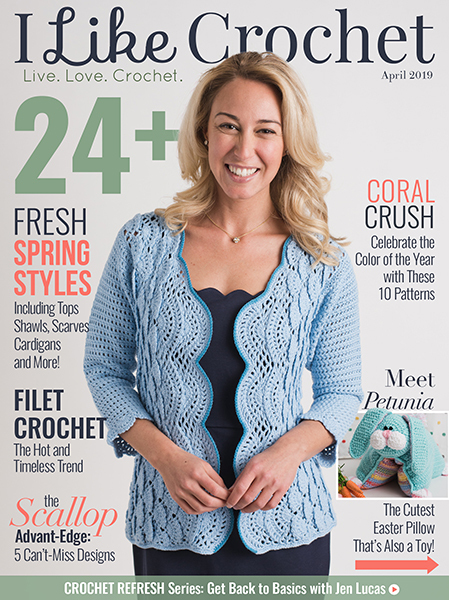 If you crochet (or knit) for long enough, eventually you’re going to want to make something with seams. And while seamless patterns are great, seams can add a lot of structure, prevent stretching in the wrong places, and are important for the majority of motif projects. 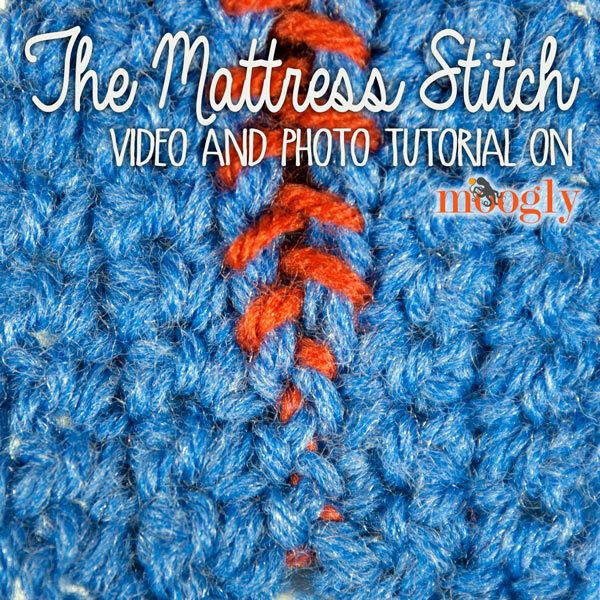 There are a variety of seaming techniques out there, but this tutorial focuses on the most invisible of seams – the Mattress Stitch! Here’s how it’s done. 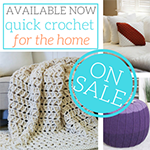 The mattress stitch brings together two pieces of fabric, crocheted or knitted. The key is to mirror what you do on one side or one piece with what you do on the other. If you’re working into the top edges, as shown here, it’s easy to keep things even because each stitch is clear. 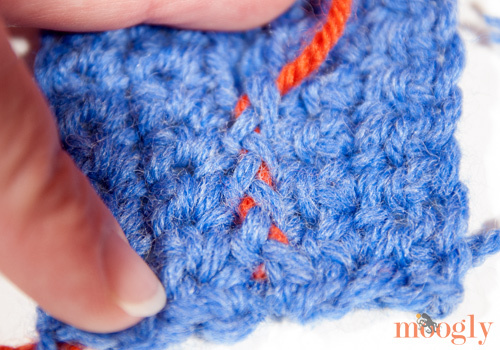 If you are working in the side edges, then go through the same part of the stitch on each side when you can, and just watch your spacing and be consistent when you cannot. 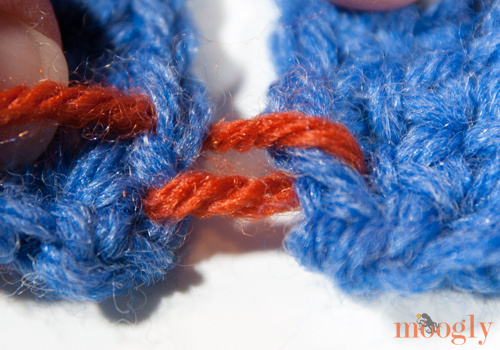 And here’s an important tip: when seaming a long section (particularly when working into the side edges), use stitch markers or clips to hold the pieces together in several places as you want them sewn, so you don’t end up with one side shorter than the other! 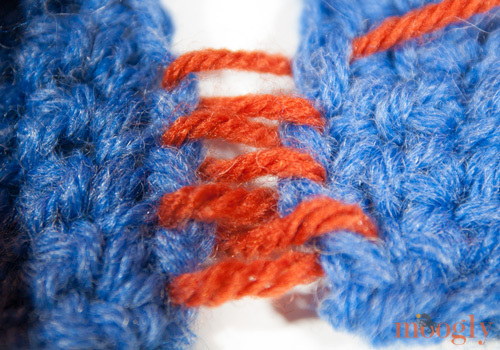 In this tutorial I’m using a contrasting yarn so you can see the stitches – but when you work this stitch for your project use a matching yarn for truly invisible stitching! 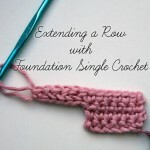 This tutorial was made using Lion Brand Wool-Ease Worsted. 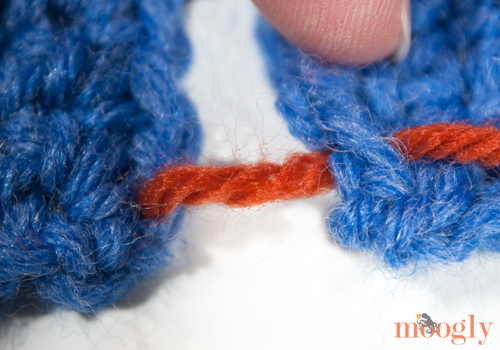 Step 1: Thread a yarn or tapestry needle with the yarn you’ll use for seaming – a long tail end is perfect if you’ve got it! 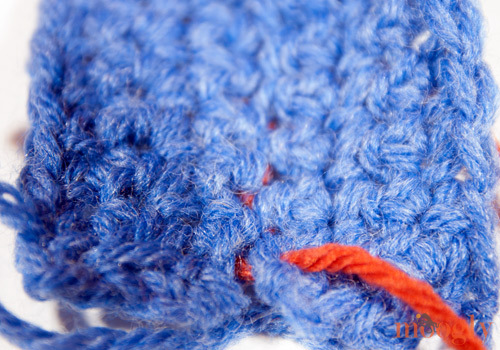 Bring it through the first stitch from the wrong side of the fabric to the right side. 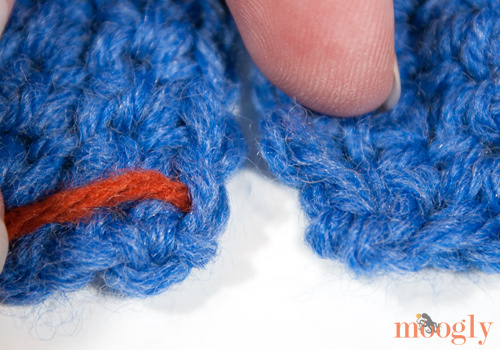 Step 2: On the opposite side or other piece of fabric, sew through the first stitch from the back to the front – mirroring the stitch on the first side. Continue with the next set of stitches, working each side back and forth, sewing from the back to the front, or wrong side to right side, keeping it even. After you’ve worked several sets of stitches, start tightening up the first few. And watch them disappear! It even looks good from the back! Continue til you’re done – that’s all there is to it! Seaming takes a bit of practice to be sure, but it’s an important skill to add your arsenal, and adds so many more patterns to the list of things you can make! When you use the same color of yarn to make the seam as you did for the fabric, it really does disappear. And the resulting seam is flat and nearly invisible! I hope you’ll give it a try! That is awesome! Thank you so much for demonstrating this. I can’t wait to use it! I hate seaming, but you certainly made it simple and the end result is fantastic. I’ll give it a try … thanks! 😀 Thank you Jane! It can be a chore, but it’s usually worth it! I really like that the seaming just disappears with this stitch. 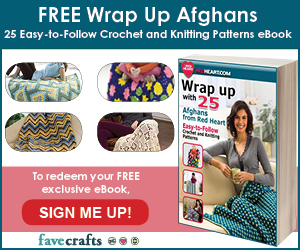 Do you think it would be good to use when seaming afghan squares together? This is awesome. I was making a sweater for my grandson and used this to stitch the shoulder seams for fitting. It really works! Thanks for sharing. 😀 So glad to hear it Donna! You’re welcome! 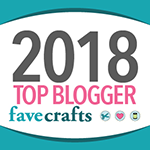 I just can’t say enough how much I love your blog! It’s so helpful, I appreciate all the hard work and effort you have put into it! Thank you! Love this seam Tamara – thanks very much for the tutorial – will be using it much more in the future! 🙂 Thank you Ali, glad you like it! I love this video. it is the one i search for each time i have to join! This is exactly what I was looking for! 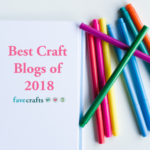 Do you have any suggestions for how to do this while stitching together squares of different colors, or even a different method to where the seem would still be as invisible as possible? I Have crocheted about 4-5 varying colors, mostly shades of green, to try putting together a Minecraft Creeper blanket for my son. I’m thinking of using the lime shade of green with the most amount of squares for this combination, and just praying it will come together invisible. Last, the border will be the same shade of lime green that has formed most of the squares. Lime green is the main shade, but there are also hunter green, grey, and a few white squares as well. Any ideas or suggestions would be greatly appreciated. I wish I could attach a pic, but if you happen to see this and respond, you could simply Google Minecarft Creeper blanket. I’m a complet beginner and just want this to turn out as good as it possibly can, as I am very OCD also. Ah Minecraft! I have some obsessed sons myself. 😀 This is the most invisible seam I know of. 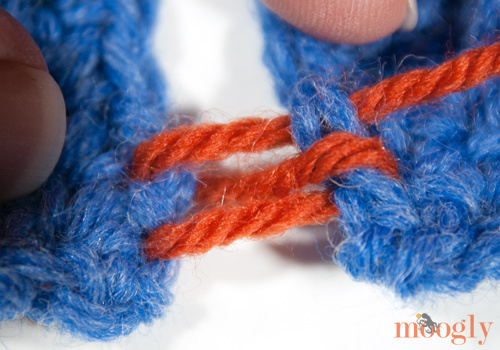 For the border, it might be fun to hold two colors together while crocheting a simple sc border – skipping every other or every third stitch as needed, since the stitches will be thicker. I am in the process of finishing up a sweater and will need to put it together next. I have been looking at the tutorials for the various joining methods but don’t know which is most suitable for putting together a sweater. What do you think? 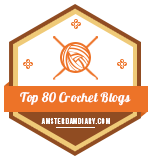 I’ve crocheted for over 50 years and I’m just now learning about this?! Cannot wait to try this out! Thank you! 😀 I’m so glad you like it, thank you Karen! 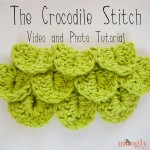 How do you attach the beginning yarn tail? I’m so glad it helped, thank you Caroline!